There has been lot’s of debate in the press and in academic circles over the last week or so about whether Italy’s latest contraction constitutes a triple dip recession or simply a continuation of what’s been going on over many many years. This is an interesting theoretical nicety, but in fact what is happening in Italy at the moment goes a lot further than problems faced by a recession dating committee. The real issue that arises in the context of the Euro Area at the moment is a far more specific one. Will the ECB do QE? And if it does when will it push the button? And what could happen if it doesn’t. Perhaps a case study of the Italian case is worth the effort here. What is likely to happen to Italian debt if there is no ECB intervention soon? Let’s take a look at the dynamics. By now almost everyone and their grandad knows that Italy is back in recession following the 0.2% GDP contraction in the second quarter. 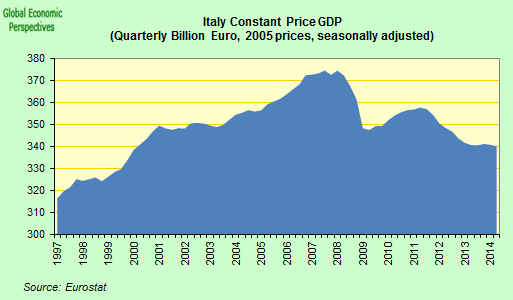 Not only did this result suggest that Italy was now in a triple dip recession (or a twenty year decline), it also meant that GDP was back at the same level it had in 2000, when the country entered the Euro currency union. 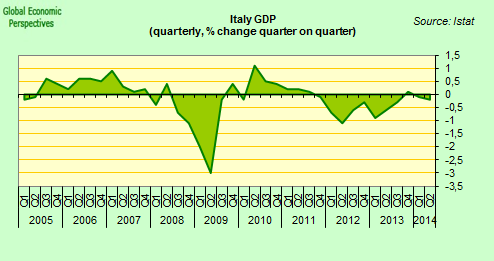 The problem is that Italy has an appallingly low trend GDP growth rate – possibly negative at this point – and nothing which has happened since the financial crisis ended suggests it is going to to improve radically anytime soon, in fact there are good reasons to think that growth could even deteriorate further. In the first place Italy’s working age population is now falling, and many young educated Italians are leaving to work elsewhere. And now, not only do we have the legacy then of high debt and low growth, a new problem has emerged: low inflation or even deflation. 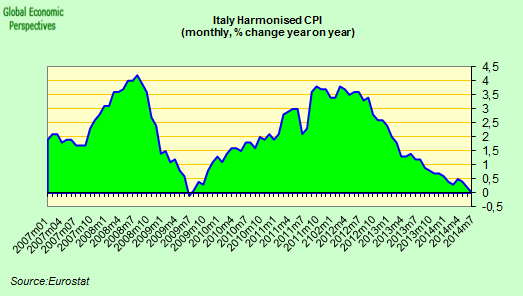 Italy’s inflation has fallen to zero. The combination of low inflation and low growth means that it is the evolution of nominal GDP that really matters now. Nominal GDP is non inflation corrected GDP (or GDP at current rather than constant prices). If inflation remains low or even becomes negative, then nominal GDP will hardly increase and may even continue to contract (as has happened in Japan). The result is bound to be that the gross government debt to GDP ratio rises above the 135.6% it hit in March. One of the arguments frequently advanced about how this dynamic could be turned around would be for Italy to run a “large” primary budget surplus. Now the emphasis here is on large since the country has in fact run a primary surplus (income – expenditure before paying debt interest) since the early 1990s, but that hasn’t stopped the weight of the debt climbing and climbing. The IMF, in their 2013 Fiscal Monitor outlined a scenario in which the obligations of heavily indebted European sovereigns first stabilise, and then fall to the 60% level targeted by the EU’s Fiscal Compact by 2030. It makes assumptions regarding interest rates, growth rates and related variables, and computes the cyclically adjusted primary budget surplus (the surplus exclusive of interest payments) consistent with this scenario. As they point out, the heavier the debt, the higher the interest rate and the slower the growth rate, the larger the requisite surplus. In fact they found that the average primary surplus required in the decade 2020-2030 was 5.6% for Ireland, 6.6% for Italy, 5.9% for Portugal, 4.0% for Spain, and 7.2% for Greece. 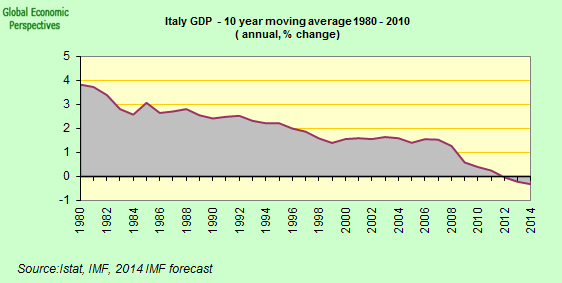 Is it plausible that Italy could run an average primary surplus of 6.6% of GDP over a decade? Hardly – in particular this implies that on average, every year, the government would be draining out 6.6% of GDP from domestic demand via taxation. Yet as I have noted many times, domestic demand is precisely the weak point in the Italian economy (secular stagnation, ageing population). Italy’s situation is to some extent replicated in other countries on the periphery (Ireland sovereign debt to GDP 124%, Portugal 132.9%, Spain 96.8% and Greece 174.1%, all numbers as of March 2014) since almost all official forecasts anticipate an imminent turnaround in the debt dynamic. If secular stagnation and ultra low inflation really set in this turnaround is going to be impossible to achieve and Europe’s leaders will need to decide what to do about it. Italy’s debt now looks certain to climb towards 140% of GDP and beyond (maybe hitting that level as early as Q1 2015), meaning someone somewhere in the official sector should be able to recognize that it is not on a sustainable path. The so called AQRs (bank Assett Quality Reviews) are probably not going to generate too many surprises, but what about doing some realistic DSA’s (Debt Sustainability Analyses)? Cases like Greece and Portugal are to some extent containable from an EU perspective since the economies are small enough for EU leaders to engage in some sort of extend and pretend via low coupons and long horizon maturities. 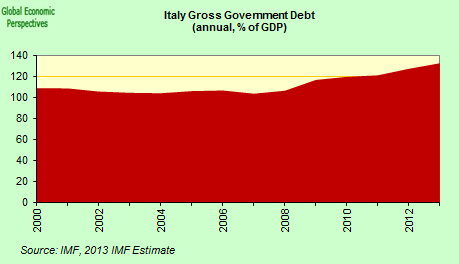 But Italy’s debt is simply too big to be manageable in this way. So EU leaders and the ECB now face a dilemma. Trying to make Italy comply with its EU deficit and debt obligations may well mean that the deficit comes down but in all probability the debt level will go up (given the weak nominal GDP effect). Not complying with them opens the possibility of stimulating slightly more growth (and possibly mildly stronger inflation) but naturally the debt level will rise. It’s a sort of damned if I do and damned if I don’t situation, since either way the debt burden rises. From the point of view of the country’s political leaders though, it is obvious that austerity today has costs (and few visible benefits) while deficit spending may bring some short term benefit at the price of hypothetical longer term debt issues. It shouldn’t surprise us then if they go for the latter, especially since Japan’s political leaders have been widely applauded for doing something similar. Naturally, since the difficulties the onset of secular stagnation will produce for heavily indebted countries with ageing and shrinking workforces are not widely understood, hints that deficit objective relaxation calls are growing have not been well received everywhere. During the spring the FT published details of a document jointly issued by the German and Finnish finance ministries which strongly rebuked Brussels for easing austerity demands, citing in particular the additional flexibility given to France and Spain for reducing their budgets to within EU deficit limits. As might have been expected, Matteo Renzi was not slow in coming forward to seek similar treatment for his country (See “Italy request to push back budget targets dismays Brussels” FT April 17). According to the newspaper the country’s finance minister, Pier Carlo Padoan, sent a formal written request to the commission on 16 April seeking authorisation for a change in objectives. Citing the “severe recession” that set Italy back in 2012 and 2013, Mr Padoan wrote that Italy wanted to “deviate temporarily from the budget targets” and that because of “exceptional circumstances” (my emphasis throughout) the government had decided to accelerate the payment of arrears owed by the public to the private sector by €13bn, which would increase the debt to GDP ratio in 2014. The trouble is that these “temporary factors” and “exceptional conditions” seem to arise with a predictable regularity in Italy’s case. The country is currently aiming for a balanced structural budget in 2016 rather than 2015 as agreed with Mario Monti’s technocrat government in 2012. A year earlier, then prime minister Silvio Berlusconi had promised a balanced structural budget by 2013. The relationship between Mario Draghi and Matteo Renzi has long been a source of speculation and gossip. Shortly after he came to office in February following a kind of palace revolution inside his own party whereby the incumbent Prime Minister – Enrico Letta – was unceremoniously defenestrated the Financial Times Brussels correspondent even published a post on an FT blog with the rather direct title: Does Renzi owe his job to Draghi? The gist of the article was an attempt to establish some sort of connection between Matteo Renzi’s arrival in office and the the outcome of the then recent German Constitutional Court ruling which put into question the viability of the central bank’s OMT (Outright Monetary Transactions) programme. Spiegel’s hypothesis was that the driving force for some kind of “unholy alliance” between the two of them lay in Draghi’s interest in getting prime minister Letta out of office before pressure from within Germany about maintaining open the offer of a now legally questionable OMT programme to an Italy which was visibly enjoying cheaper bond yields – but was manifestly not advancing with its reform programme – became too strong to withstand. The key part of the background here is that the German court ruling effectively left OMT – which only ever had a virtual existence and was increasingly seen as an empty bluff since it was clear no one was going to accept the conditionality side – deader than that infamous dead duck. Karlsruhe’s objection to the existing bond buying programme was that it went beyond the ECB’s mandate since directly financing government debt is prohibited under Maastricht, and the objective of OMT was to help governments finance at an affordable price. Since break-up risk – which could have offered an alternative justification for OMT – is for the moment off the table, OMT lacked definitive legal justification and in practical terms the emperor visibly had no clothes. It was just a question of how long the markets needed to wake up to the fact. So it was imperative to find some other justification for the initiation of a bond purchases programme should one be needed. Then along came deflation. The important point is that if a programme of bond purchases is implemented as a form of QE it will differ from the earlier OMT programme in terms of the justification offered. Any QE programme introduced to combat deflation would be implemented as part of an attempt to attain price stability, an objective which does lie within the central bank mandate. Another key difference is that if QE is launched and involves bond purchases the bank will buy bonds from ALL countries in the monetary union (according to their weight in Euro Area GDP), which brings us to the third difference from OMT: there will be no conditionality attached. Given this it became a “high risk” operation and it was clear that Mario Draghi needed someone else at Italy’s helm if he wanted to be able get the Germans on board with QE, someone who could convince them Italy would enact the required reforms. Enter Matteo Renzi. Now fast forward to August, and we find the former mayor of Florence who had surged to office on the back of promises to enact aggressive labour market reforms, a battery of spending and tax cuts and significant privatizations has been strong on talking and very weak on action. Something which is not uncommon in Italy, but people had expected more. They thought this time was different. Mario Draghi’s irritation with the situation was visible at the August ECB press conference. When asked by one of the journalists why Italy had fallen back into recession he could hardly contain himself, and was unusually direct in saying a lack of structural reforms was holding the country back and hampering a return to growth. The reference to Renzi was evident. One week later the two met, in what they had obviously hoped would be a secret meeting but Italy being Italy the press went along for the ride. While no details of what happened at this meeting have transpired it is pretty clear Draghi will have used the opportunity to read his fellow countryman the riot act. Italy has been full of talk about some kind of Troika intervention, but this is most unlikely, and Renzi made it pretty clear in his Financial Times interview that he personally wouldn’t be asking for one. 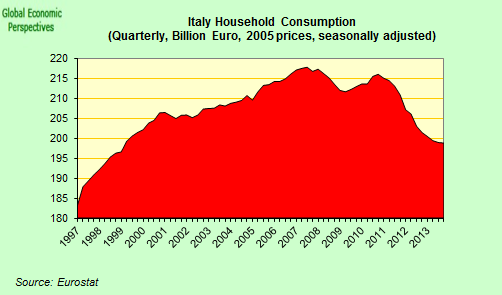 The problem is that with the debt dynamics we have seen above the one thing Italy doesn’t have at this point is time. It isn’t a problem of the impact of a so called “debt snowball” as interest rate payments send debt levels spiraling upwards. If anything it’s worse. Mario Draghi can, in theory, contain the debt interest problem, and if needs be along with it the capital repayments schedule. But the problem Italy has at the moment is one of the credibility of its debt, of the country being able to convincingly argue its trajectory is sustainable, of being able to convince the Germans that if the ECB were to buy bonds these they could EVER be redeemed. While Renzi has waxed eloquently about transforming Italy, buoyed on by the results of the European Parliament elections he seems more concerned with pushing through electoral reform – which is obviously needed but is not perhaps as pressing as the growth and debt problem – leaving the suspicion that he is more interested in getting re-elected than anything else. Indeed the fact that he needs the support of the discredited former Prime Minister Silvio Berlusconi to get the reform through with any kind of urgency (see Italy Slips Back Into Recession, As New PM seeks Berlusconi’s Help) has lead critics of the two “institutional parties” to suggest the reform may be more about getting rid of newcomers like Beppe Grillo’s Five Star movement than anything else (see Renzi slammed for “coup” over senate changes) . To date Renzi’s government – which is almost operating outside real historical time in terms of economic issues – has made little progress on the sort of reforms which might help the country recover some kind of growth, like those to the judicial system and the labor market. The only measure that could be considered vaguely “pro-growth” that his government has enacted was the 80 euro bonus delivered to low-wage workers hasn’t boosted the economy as its proponents claimed. The measure seems more cosmetic – comparable with José Luis Zapatero’s ridiculous “Plan E” in Spain – and only reinforces the impression of politicians fiddling while Rome burns. The business lobby Confcommercio, which was highly critical of the measure, calculated that consumption was boosted by just 0.1% in June, the first month in which the tax relief was operative. In their press release they said Italian families were holding back from shopping “because their uncertainty about the future was stronger than the actual increase in funds in their pockets”. Despite this Prime Minister Renzi continues to insist that his government’s economic strategy is sound and will lift the country out of crisis.In a lengthy interview broadcast on La7 television following the announcement of the GDP results, Renzi said that his government was determined to get the economy back on track, but in due course. “We will work better and harder, but I promised to change direction, not to change the universe in three months time,” Renzi said, adding that only a “comic book superhero” could turn around the economy in a matter of months. “Calmly, serenely, we are taking this country by the hand and pulling it out of the crisis,” Renzi told listeners. The problem outside observers are having is not in seeing the complete turnaround – Renzi is right here, this involves a long painful road – but in identifying the first baby steps that are being taken. And fears about Mr Renzi’s grasp on Italy’s finances were fanned again last week when spending review commissioner Carlo Cottarelli highlighted the tensions which existed in the government over the prime minister’s spending plans. In a post on his blog, Mr Cottarelli – who was appointed by Letta and was previously Director of the Fiscal Affairs Department at the IMF – said that earlier savings were already being used by parliament for other expenditure, meaning that in the longer term they could not be used to reduce taxes on employment (which is what they were intended for). To add insult to injury, more bureaucratic delays mean that the treasury will not hit its target to raise €12bn from privatizations this year. There are also concerns about the outcome of the European Central Bank’s stress tests and asset quality review of the country’s leading banks. Bankers point out that if an Italian bank needs a bail out the state’s coffers will not easily be able to support it. Of course here we have a mighty instrument which Draghi can use to twist Renzi’s arm. Another issue is labour market reform. The controversial Article 18 of Italy’s workers statute is “just a symbol”, and “debating it is a pointless exercise”, Renzi told State broadcaster RAI 3 last week. The comments came after Interior Minister Angelino Alfano, who comes from the New Center Right (NCD) party, called for its abolition. Article 18 of the 1970 Workers Statue is a law that forbids companies with over 15 employees from firing people without just cause. 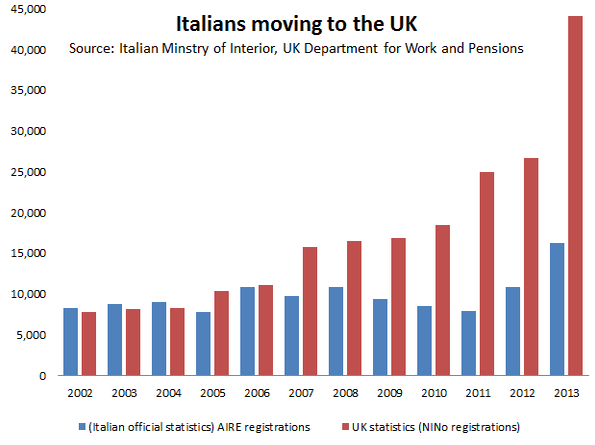 The Italian Prime Ministers reluctance to tackle the labour market issue is understandable. Any attempt to really change Italian labour law would be deeply unpopular on the left (and even among many in his own party) and a direct clash with Italy’s unions would surely cost him votes if his plan is to hold elections after passing a new electoral law. More fiddling while Rome Burns. So Which Way For The ECB? Evidently members of the EU Commission, ECB governing council members, and senior political leaders in Berlin, Amsterdam or Paris are neither theoreticians nor intellectuals. The secular stagnation hypothesis is at this point more akin to a theoretical research strategy than a workable template for policy-making, and policymakers are understandably reluctant to take decisions on the basis of what is still largely a hypothesis. As the editors of a recent book on the topic put it in their introduction: “Secular stagnation proved illusory after the Great Depression. It may well prove to be so after the Great Recession – it is still too early to tell. Uncertainty, however, is no excuse for inactivity. Most actions are no-regret policies anyway”. As they suggest the risks here are far from evenly balanced. If countries like Japan, Italy and Portugal are suffering from some local variant of one common pathology, then normal solutions are unlikely to work, and matters can deteriorate fast. Naturally the ECB can go down the Abenomics path, and institute large scale sovereign bond purchases even while the Commission turns an increasingly blind eye to higher deficit spending at the country level. 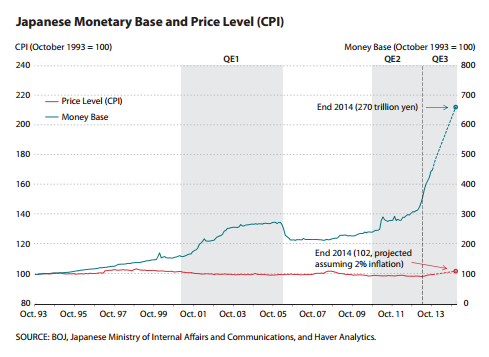 But it is far from clear that Abenomics works (see here) and if it doesn’t what happens to all the accumulated debt? On the other hand time always has a cost. Letting things drift further means letting debt levels rise, and risking testing market patience and this becomes especially important in the cases of Italy and Portugal. The longer time passes the more difficult it is going to be for anyone to convince themselves that the debt of these countries is sustainable. So there may come a point after which the Germans simply will not allow Draghi to buy Italian bonds without a prior haircut. OK, they’ve said they won’t do more PSI, but they’ve said a lot of things, and the cost of irritating investors is limited when you have a regional current account surplus and a central bank buying bonds. Maybe the costs of the Euro “widowmaker” trade will be borne by all those eager bond purchasers who thought nothing could possibly go wrong. I am sure German politicians would decide a loss of credibility on PSI would be less costly to them than getting German taxpayers on the hook for current Italian debt levels. Especially in a country where they are now proudly announcing they have reduced government debt for the first time in more than 50 years. So in this case, maybe the turkeys just did vote for Xmas. The thing is, despite the meeting between Draghi and Renzi (who may also be a turkey by Xmas) nothing substantial is going to happen in Italy. The government is under no pressure to ask for help (and doesn’t even feel it needs it), and Draghi won’t act before things change. Gridlock – with rising debt. Naturally in the short term the “Mario Draghi ultimately has my back” feeling will still prevail, but with markets continuing to finance debt levels that any official study will soon have to recognize as unsustainable lack of proactive policies from the ECB will only fuel concerns that the size of the pill may become just too big for the bank to persuade Germany comfortably swallow, leaving the specter of private sector involvement to once more rear its ugly head. How do you tell people who have just sacrificed hard to get their debt under control that they are now about to help “pardon” 50% of someone else’s. It simply doesn’t make sense. 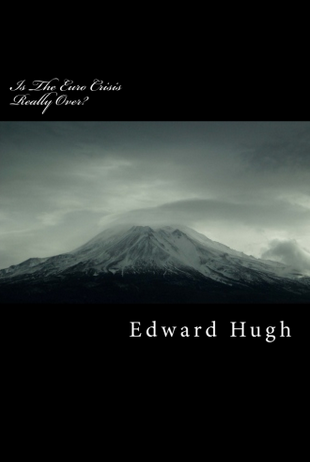 These arguments are developed at greater length in my new book “Is The Euro Crisis Really 0ver? – will doing whatever it takes be enough” – on sale in various formats – including Kindle – at Amazon.